Kubotan Keychains and how to pick yours? Kubotan Keychain types and how to pick yours? 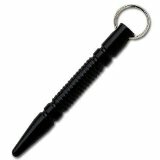 The Kubotan keychain also known as a kubaton keyring is nothing but the modern version of the yawara stick. Since you will not leave home without your keys, having kubatons as keychains helps to improve the chances of having the weapon at disposable all the time. It also helps in naturally concealing the weapon and making it look more innocuous. Another advantage is that keys can be used in some self defense strikes, like scratching your attackers face while moving them like a nunchaku. 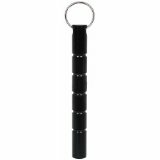 Kubotan self defense keychains can be made of wood, steel or strong forms of plastic. The most effective and the most durable is the steel though. There are also a variety of forms for the kobotan. It can be standard flat ended, plunt or spike ended. There are also other famous versions like the hollow kubotans, kubotan knives (both are illegal in most cities) and flashlight kubotans which also come in the form of a key chain or can be attached to one. Here are the spike, plunt and flat ended respectively. The spiked is the most sold type as most people think it is better or more effective. This is probably not very true as it might limit your ability to deliver some types of techniques. Plus that it actually looks more dangerous and will bring more attention to it when most people will think of it as a real weapon. This probably might be bad thing from the legal perspective. So, when choosing your kubotan keychain make sure it’s heavy and sturdy enough. I would also recommend the flat ended over the pointed one’s. Finally there is your personal taste; don’t forget you will be carrying this keyring around so it needs to match your personal style. Above all DO NOT forget to check your state law in this regard. Let’s touch on the most common ones briefly. The spiked kubotan is a very common choice that people pick. 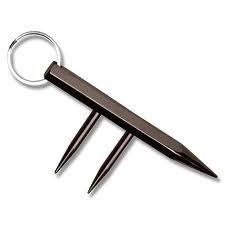 In our opinion the spiked keychain is not the best option for real life self defense applications. Spikes limit your ability to perform certain techniques and locks. The second reason is that punching with the spikes is a good way to get yourself into legal trouble and doesn’t actually improve your chances of defending yourself in an attack. Moreover, it looks dangerous and offensive and might not be legally tolerated in different states. The fury kubotan (grooved kubaton) is another common choice that we would like to consider. 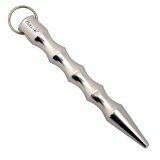 It’s a lightweight, aluminum keychain that has finger grooves to strengthen the grip over the weapon . 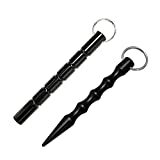 The fury key chain can be used to apply the same kubotan techniques to parts of an attacker’s body, causing non-lethal shock. The included key ring attachment allows you to keep your keys and self defense all together. The fury kubotan is very good choice, however again it’s pointed and this need to be considered from a legal perspective before buying one. The following are some examples for Kubaton keychains that are considered illegal in most states around the world. So before carrying a kubotan make sure to check that it is allowed to carry it. In some cases carrying a kubaton might not be an option. It could be legally regulated or it might not just match your personal style to carry it as a key chain. For similar situations there are some available alternatives that could more or less act the same function as the kubaton. Here are a couple of alternatives. Tactical flashlights are originally flash lights made for law enforcement personnel to aid them in identifying an attack or for shooting in low light situations. It was originally designed to be weapon mounted. Now tactical flash lights are also available for civilians. The flash light can be used in multiple ways like illuminating a dark surrounding or momentarily disorienting an attacker by shining the strong bright light directly into his eyes and they can also be used as a kubaton since they are always made of solid strong materials. Tactical pen is an everyday tool that is available to anyone and can be taken everywhere. 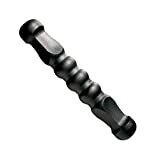 It looks and functions like a normal pen that,when necessary, can used for self defense, just like the kubaton is used. Tactical pens are made of very solid materials and are designed to deliver intense force on pressure points on the human body. There are some other not very famous alternatives for the kubotan keychains, but the beautiful thing about the kubotan is that is just a simple rod of metal. Learning how to use it for self defense offers great possibilities of improvised weapons. A wooden kubotan is a very interesting self defense weapon, they usually come in very elegant and sometimes customized shapes. They are not the most common sold in the market though. They are usually made of hard wood weather it’s machine turned (cheaper) or hand made (more expensive). For example the wood kubotan can be made of walnut wood, boxwood, dogwood as they are all hard enough and are not expected to break down. If you would be interested on having a wooden kubaton you can always make your own or you can look on some online shops which specialize in good quality types of wood kubotan keychains. As one to start with you can have a look at www.cooleysticks.com and ZanozaWorkshop. Where to buy a Kubotan? Extend your knowledge about how to use the kubotan for self defense and learn the basic techniques with few videos that can be applied in a street fight to defend yourself. We also have created a simple 5 step kubotan training plan for you to do at home. For those who like a DIY style, here are some instructions for a homemade kubotan. Kubotan training: How to train at home?